Widely considered among the greatest films of the 20th century, the science fiction epic 2001: A Space Odyssey will return to select U.S. theatres in 70mm. 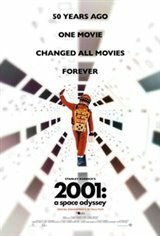 With 2001: A Space Odyssey, director Stanley Kubrick redefined the limits of filmmaking and cemented his legacy as one of the most revolutionary and influential film directors of all time. Originally released on April 4, 1968, the film ignited the imaginations of critics and audiences alike and its impact continues to resonate to this day. Celebrating the 50th anniversary of the seminal film, Warner Bros. Pictures is releasing an "unrestored" 70mm print of the director's groundbreaking science fiction epic. A true photochemical film recreation, this print was struck from new printing elements made from the original camera negative. There are no digital tricks, remastered effects, or revisionist edits. Christopher Nolan, a longtime admirer of the late American auteur, worked closely with the team at Warner Bros. Pictures to oversee the mastering process.